Visit beautiful memorials and monuments, including Arlington National Cemetery, the National 9/11 Pentagon Memorial, the Women in Military Service for America Memorial and many more. 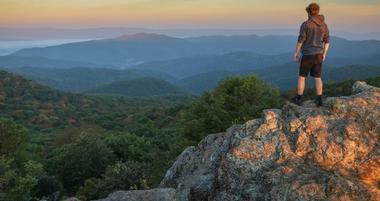 Learn about history, explore the Blue Ridge Mountains or relax on the beach in the beautiful state of Virginia. Visitors enjoy mountains, rock formations, old mines, wild ponies, and an abundance of natural beauty in this great state. Explore Richmond's historic attractions, museums and gardens on your weekend trip. 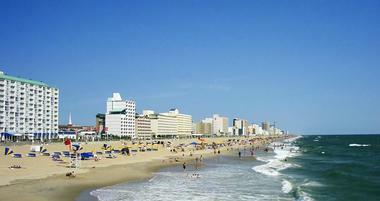 Virginia Beach is famous for its sandy beaches, romantic sunsets and a choice of activities. 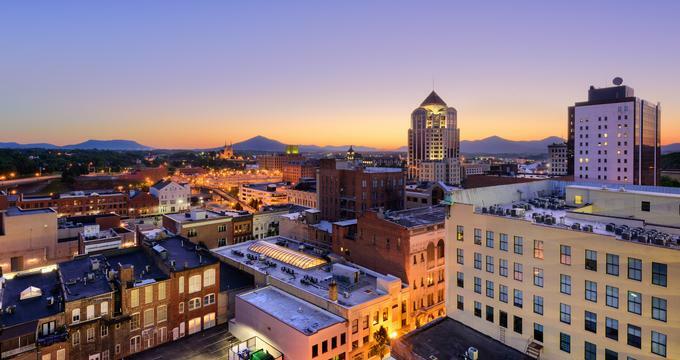 On your trip through Virginia's Blue Ridge Mountains, stop in Roanoke where you will find beautiful parks, unique museums and great restaurants. Plan a weekend trip to Charlottesville to learn about U.S. history, explore unique attractions and eat great food. 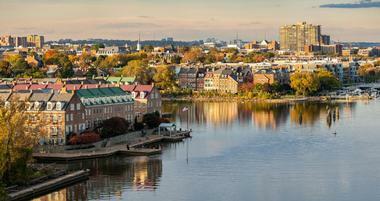 Get to know Alexandria's Old Town, historic attractions, museums and parks. Winchester, Virginia, is a small city set in the beautiful hills of the Shenandoah Valley. Visit Historic Jamestowne, Busch Gardens, Water Country USA and other famous attractions in Williamsburg, Virginia. Virginia is a southeastern American state that stretches between the Chesapeake Bay and the Appalachian Mountains, with a beautiful, rugged, long Atlantic coastline. One of the original 13 colonies, Virginia has large number of historic landmarks such as Jefferson’s plantation Monticello, the living museums such as Jamestown Settlement and Colonial Williamsburg and a large number of charming cities in which history lives happily married with modern, vibrant way of life. From sophisticated Richmond and Charlottesville to small but proud towns like Abingdon, Virginia’s cities and towns are unique and full of character. Virginia’s magnificent, diverse nature is protected in a large number of small or big parks like Shenandoah National Park or Chincoteague National Wildlife Refuge. The City of Charlottesville is located about 70 miles from Richmond, Virginia, at the foothills of the majestic Blue Ridge Mountains, on the upper Piedmont Plateau. Charlottesville was established in 1762 and was home to three American founding fathers. It is lively, modern university town with history tightly woven into its fabric. University of Virginia campus is great spot to start your exploration of Charlottesville, continuing through elegant streets lined up with magnificent buildings Thomas Jefferson designed. You can visit his home, as well as homes of the former American presidents Monroe, Madison and Jefferson. 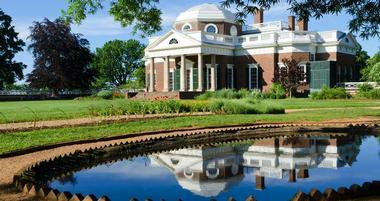 Learn about Jefferson as a person while touring his home Monticello. Take the kids to the interactive Virginia Discovery Museum where something new is happening every month. Enjoy the walk along the gorgeous Saunders-Monticello Trail, take a tour of the local wineries and vineyards and visit the fascinating Kluge-Ruhe Aboriginal Art Collection of the University of Virginia. Virginia Beach is a lovely coastal Virginia city on the Chesapeake Bay famous for its three-mile long boardwalk and beautiful beach-lined oceanfront. The First Landing State Park brings history to life – it is a spot where first English colonists landed in 1607. Take the kids to the fascinating Virginia Aquarium & Marine Science Center with sharks, sea turtles, rays and much more. Take a kayak eco tour to see dolphins close and personal. Climb 191 steps to the top of the Cape Henry Lighthouse for magnificent views. Visit Military Aviation Museum to see some beautifully restored and working old planes. For a bit of history, visit the Thoroughgood House, a home of one of Virginia's original colonists. Get your adrenaline going at the iFLY Va Beach Indoor Skydiving and enjoy the tranquility of the False Cape State Park. Williamsburg, Virginia, is a small historic city on the Virginia Peninsula, once a capital of the Virginia Colony and an important player in the American Revolution. Start your exploration of Williamsburg in the Colonial Williamsburg historic dstrict, a living museum where you will feel like being transported to the Colonial times, with actors dressed in period costumes and ornate architecture of the times. Visit ornate, elegant Governor's Palace to see how the rich lived in the 18th century. 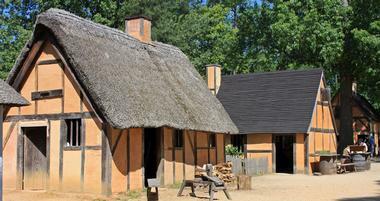 Explore Historic Jamestowne, the first 1600’s English settlement in America. Treat the kids with a trip to the Busch Gardens Williamsburg with some hair-rising rides. If you enjoy spooky adventures, take a Spooks and Legends Haunted Tours of Williamsburg. Only about 75 miles from Washington, D.C., Shenandoah National Park is 200,000 acres of pure beauty, with deer, birds, 500 miles of spectacular hiking trails, thundering waterfalls, ancient forests, serene meadows, wide open 105 miles long Skyline Drive, comfortable campgrounds and sky full of stars. About 75 miles of the Blue Ridge Mountains’ crest is in the park as well as 101 mile of the Appalachian Trail, which runs parallel to the Skyline Drive. Whatever trail you take, on foot, on a horseback or a bike, will bring you to a view that will take your breath away. If camping is not your thing, check Big Meadows Lodge, Skyland or Lewis Mountain Cabins. A country’s favorite scenic road, Blue Ridge Parkway is an experience - a relaxing, slow drive through endless stunning views. For 469 miles, the road meanders through the rugged, forested mountains and valleys of the Appalachian Highlands. Along the way you can stop to stretch your legs and hike on one of many trails that cover 300 miles. The diversity of habitats and plants and animals they support is astounding. From 649 feet at Virginia’s James River to 6,047 feet at North Carolina’s Richland Balsam, the habitats change and with them plants and animals you may encounter. There are over 100 species of trees and driving through azaleas in bloom in early spring is an unforgettable sight. You will cross five rivers and you will be driving across one of the oldest mountains in the world. Located about three miles from Appomattox, Virginia is the Appomattox Court House National Historical Park. The park was established in1954 in the village of Appomattox Court House where Virginia ended the American Civil War in 1865, signaling the birth of a new nation. The Park consists of several original and many reconstructed 19th century houses. The village was the site of the Battle of Appomattox Court House and one of the village houses, belonging to Wilmer McLean, is where the Confederate army under Robert E. Lee surrendered to Union commander Ulysses S. Grant. The McLean House has been meticulously reconstructe and contains many original pieces of furniture. Divided between Maryland and Virginia, Assateague Island is a barrier island located just off the coast of Delmarva. 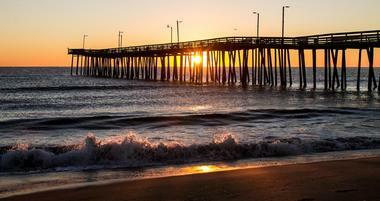 The island is 37 miles long and most of Assateague Island National Seashore and Assateague State Park is in Maryland. Chincoteague National Wildlife Refuge and the popular beach and interpretive facilities are in Virginia. The island is best known for the large herds of feral horses, beautiful unspoiled beaches, and the historic Assateague Lighthouse. 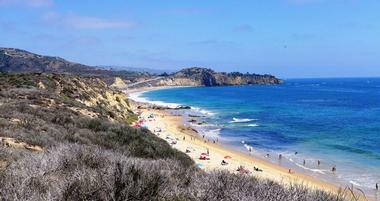 The island has a number of wild marshes, deep bays, and pretty coves, such as the popularToms Cove. While it is possible to get to the island by car, there is no road that provides access to all parts of the island. Chincoteague National Wildlife Refuge is located on the Virginia portion of Assateague Island. Established in 1943 mostly in order to protect migratory birds such as Greater Snow Geese, today the refuge is home for wading birds, waterfowl, shorebirds and song birds. The diverse environment which spreads over 14,000 acres includes beach, marsh, dunes and maritime forest and is also home to many other animals and large number of species of plants. The most popular animals seen in the refugee are Chincoteague ponies, which have been roaming the island for the last almost 300 years. The area is very popular for walking , fishing, wildlife observing and photographing and is used intensively for environmental education and interpretation. Located in Westmoreland County, Virginia, where Popes Creek meets the Potomac River, the George Washington Birthplace National Monument was established on the location of the home in which George Washington was born on February 22, 1732. The property was established in the 17th century by George Washington’s great-grandfather John Washington as a colonial plantation. George Washington lived in the house until the age of three, and came back for a period as a teenager. Since the exact look of the original George Washington’s home is not known, Edward Donn Jr. designed and built in 1931 a Memorial House which represents similar homes of that era. Washington's boyhood home was located next to the memorial house and its foundation can be seen outlined by crushed oyster shells. Located on Alexandria’s Potomac River waterfront, just minutes from Washington D.C., Old Town Alexandria is charming section of this beautiful city, once a home to George Washington. Recognized as a national historic district, Old Town Alexandria was established in 1749 and has been the beating heart of the city ever since. All action revolves around King Street, considered one of the America’s great streets. It is a delight to walk through it, with old smooth cobblestones and more than 200 restaurants, cafes, museums, galleries and boutiques. When you get tired of walking, hop on the free King Street Trolley. With so many historic places and museums in one area, it is worth investing in the Key to the City, a discounted pass to eight of them. Grew along the old Indian trail Valley Pike, Staunton is 300 years old and probably the oldest city located west of the Blue Ridge Mountains. It developed as a transportation, trade and industrial hub, especially since the arrival of the Virginia Central Railroad in 1854. Staunton played an active role in the American Civil War and the reminders of its rich and turbulent history are visible as the lovely old buildings, museums, exciting attractions, archival collections and Civil War sites. Start your trip into the history at the Frontier Culture Museum, a colorful outdoor living history museum, as well as at the Woodrow Wilson Presidential Library and Museum. Kids will love Antique Fire Engine Museum and Frontier Culture Museum of Virginia. Take a stroll along the Confederate Breastworks Trail on Shenandoah Mountains, visit beautiful Crabtree Falls and enjoy one of many beer and wine tours. Almost 400 years old, Richmond is the capital of the Commonwealth of Virginia and “the Capital of the South” - Richmond was the capital of the Confederate States of America during the American Civil War. 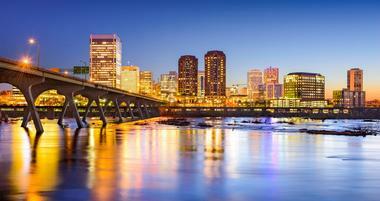 A modern, vibrant city, Richmond is great place to visit regardless of your interests. 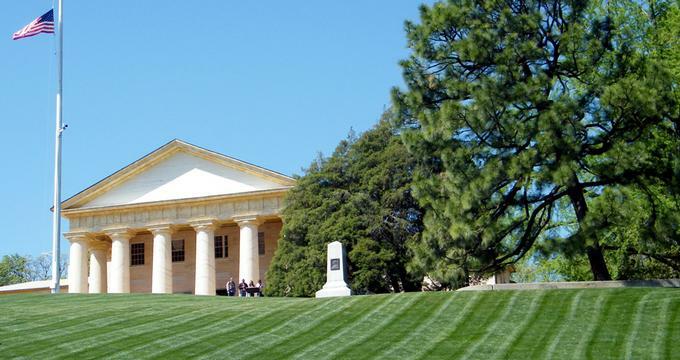 If history is your thing, start by visiting the imposing Virginia Capitol, designed by Thomas Jefferson. Watch actors in period costumes reenact the famous moments in history. Touch the famous Civil War cannon at vast Malvern Hill Battlefield and get the feel of history at Henricus Historical Park. Take a stroll along James River with its famous urban falls, have a look at the murals on the city walls, check one of 20 craft breweries or take the kids to Richmond Metro Zoo, Science Museum of Virginia or Maymont Children’s Barn and Nature Center. With 144 miles of shoreline, the Chesapeake Bay, Atlantic Ocean, Elizabeth River and so many other rivers, Norfolk is the city on water and its life and all activities revolve around it. Start your exploration at the Norfolk Downtown with its three-mile long promenade, constant events, concerts and festivals, where you can board a cruise on the beautiful tall ship, sit on the bench and watch the water and people passing by, take one of many hiking or biking trails or have a nice dinner in one of many restaurants. Try some great local wines at Mermaid Winery, watch glass artists at the Chrysler Museum Glass Studio, take a boat or land tour of the Norfolk Naval base, the largest in the world, or relax on the Ocean View Beach Park, where you can kayak, canoe, jet ski, windsurf, swim or do nothing. Located in the Roanoke Valley and cut in half by the Roanoke River, Roanoke is the commercial and cultural center of Southwest Virginia. The best view of this modern, lively city is from the top of Mill Mountain – take the scenic Blue Ridge Parkway and visit the symbol of the city –Roanoke Star, brightly lit at night. Roanoke has rich railroad heritage, the best way to learn about it and see huge collection of antique locomotives is at the Virginia Museum of Transportation. Visit picturesque Blue Ridge Institute & Museum to see interesting exhibits on the local folklore, crafts and decorative arts. Take a walk through the Thomas Jefferson's Poplar Forest, explore fascinating Dixie Caverns and Natural Bridge Caverns and discover what shaped today’s Roanoke at the History Museum of Western Virginia. The Natural Bridge is a 215-foot-high and 90 feet wide natural arch located in a gorge carved by Cedar Creek from the surrounding limestone mountains. It is believed that the bridge is the roof of a tunnel or cave that collapsed. This very popular natural formation is located between Roanoke and Lexington in Virginia and is also the name of the nearby community and a historic hotel. The bridge and surrounding 157 acres of land were bought by Thomas Jefferson from King George III of England and consequently made into a luxury resort. Under the bridge lies a series of fascinating caverns that go 34 stories deep underground. Visitors can take a 45-minutes tour of the caves and their most interesting formation such the Colossal Dome room, Mirror Lake, the Canyon Room with magnificent stalactites and stalagmites and the Well Room. Manassas National Battlefield Park is created to protect and commemorate the site of two important battles between the Confederate and Union armies in the American Civil War. The First Battle of Bull Run was fought on July 21, 1861, and the Second Battle of Bull Run between August 28 and August 30, 1862. These two battles fought on the plains of Manassas brought the Confederates a victory and Confederate General Thomas J. Jackson nickname "Stonewall." Today, this peaceful green hill is visited by thousands of tourists who try to imagine bloody battles, which are occasionally reenacted with actors dressed in period uniforms, carrying original weapons and gear. The Henry Hill Visitor Center has exhibits and interpretation on Sudley Road by the south entrance to the park, offers exhibits interpreting the battles. They also sell maps of the battlefield and books on the topic. In Bristol, you get two for one: two Bristols, one in Virginla, one in Tennessee, with the state line running down the main street. Bristol, Virginia, is famous as the "Birthplace of Country Music", officially recognized as such by the US Congress, because its residents had contributed to preserving, recording and distributing the original early country music, traditional folk music of the local region. You can learn more about it at the Birthplace of Country Music Museum. Don’t miss the visit to the Benjamin Walls Gallery to see his world-renowned nature photographs. Stroll through the beautiful Sugar Hollow Park minutes from downtown and watch the birds from the boardwalk through the wetland area. Go fishing on Watauga River with South Holston River Company and Bristol Historical & Preservation Society to learn more about the city history through interesting original exhibits. Cedar Creek and Belle Grove National Historical Park near Middletown, Virginia was created to interpret and preserve major historical sites and the rich heritage of the beautiful Shenandoah Valley. The park has two key sites - Cedar Creek Battlefield Visitor Center and Belle Grove Plantation House. The Visitor Contact Station is located in Middletown and is great place to start your exploration, learn more about the park, the self-guided driving tour of the battlefields and about the ranger programs. The Shenandoah Valley has long and rich heritage, starting with Native Americans who shaped the land, to frontier men who came to conquer this fertile land, soon making the valley one of the biggest wheat producers in the South. Beautiful, serene valley was also a site of some of the bloodiest battles of the American Civil War such as the 1864 Battle of Cedar Creek. Park rangers offer free guided tours of the battlefield. 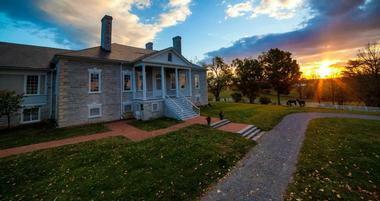 The 1797 Belle Grove plantation house is open to the public and operates independently. The Claude Moore Colonial Farm at Turkey Run is a privately owned park in McLean, Virginia, designed to serve as a living history museum showcasing family life in 1771 on a small, modest tenant farm just before the Revolutionary War. The Farm has a strong focus on authenticity and encourages visitors, children and adults, to take part in all activities on the farm and to learn how things have been done in the 18th century. The Farm has achieved wide recognition for its interactive and innovative educational programs that use the 18th-century Virginia Farm as a representation of authentic colonial history of agriculture and rural way of life. Located in the Shenandoah Valley, at the northernmost part of Virginia, Winchester offers a rich combination of historical sites, vineyards, museums, farmers' markets and elegant tree-lined streets of the Old Town. As you stroll along, imagine George Washington Stonewall Jackson stepping on the same cobblestones. The surrounding fields and orchards earned Winchester the name "apple capital of the world." The Shenandoah Apple Blossom Festival has been a city tradition for almost a century. Visit the Museum of the Shenandoah Valley, a 50,000 acres complex that includes an 18th century house and magnificent six acres garden. Visit charming house that served as General Stonewall Jackson's Headquarters. Take the kids horseback riding at the Rocking S Ranch and to the Third Winchester Battlefield for a run across the green fields. Located in southwest Virginia, in the Blue Ridge Mountains, Abingdon is a small town and a thriving art community famous for the Barter Theatre, Virginia Creeper Trail and Arts Depo, a charming 19th century freight station converted to a combination gallery and artists’ studios where you can watch artists of all media at work. Visit Abingdon Vineyard & Winery not only for their cabernet but also for the beautiful grounds perfect for a stroll. Iconic 1933 Barter Theatre, a professional repertory theatre, once launched to the stars such notable actors as Ernest Borgnine and Gregory Peck. Learn about the region’s history at the Historical Society of Washington County and rent a bike to enjoy at least a part of the 34.3-mile scenic Virginia Creeper Trail. Smithfield is a small charming town in Isle of Wight County world famous for its fabulous hams. Besides hams, you will love the feel of the bygone era in the historic downtown. Check out very informative Smithfield and Isle of Wight Visitor Center that share its space with an art gallery and learn more about the county’s history at the Isle of Wight County Museum. Visit Historic St. Luke's Church, the oldest church in Virginia, take a stroll through the magnificent Windsor Castle Park on Pagan River and Cypress Creek and take the kids to Fort Boykin and Fort Huger for a sense of history and some cool old guns. The Virginia Creeper Trail is a 34 miles long hike and bike trail from Abingdon, Virginia all the way to the town of Damascus. The trail passes along the Whitetop Laurel River and its highest point climbs to the Whitetop Station close to the North Carolina State Line near Whitetop, Virginia. The Trail is open and usable year round for biking, hiking and horseback riding. The trail, actually the former rail bed, passes by some beautiful scenery such as the Mount Rogers National Recreation area where you can pitch your tent and spend a couple of days in peaceful nature. If you like to fish, take a break by the Whitetop Laurel Creek, it is full of trout. Occoquan is a small historic town on the Occoquan River in Northern Virginia, about 22 miles from Washington DC. Start your exploration of Occoquan at the Mill House Museum and see some interesting original artifacts, documents and old photos. Occoquan Waterfront is great place to relax and have a meal at the famous Madigan’s Waterfront restaurant. Explore beautiful 1758 Rockledge Mansion , check the birds and wild animals at the Occoquan Bay National Wildlife Refuge , see what the local artists are doing at the Loft Gallery and take the kids on the Occoquan Ghost Tour and learn about the town’s dark past and past residents. Located near the town of Luray, Luray Caverns are eastern United States largest and most visited caverns. Declared a US Natural Landmark, the caverns are known for the large diversity of cave formation and spectacular color. The caves are well-lighted and walkways are paved so exploration of magnificent cathedral-sized rooms with ten stories high ceilings is easy. You will see massive stone columns and clear pools of water. The world's only Stalacpipe Organ, made of various stone formations, creates beautiful, haunting music. The Caverns attraction complex also includes the Garden Maze - one of the largest mazes in the States and The Car & Carriage Caravan exhibit with more than 140 items that include cars, carriages and coaches, some as old as 1725. The Luray Valley Museum is also a part of the complex, with a collection of historic restored buildings from the 1750's to the early 1920's.